Jane Addams স্ট্যানফোর্ড এনসাইক্লোপিডিয়া অফ ফিলোসফি-র ভুক্তি, লিখেছেন Maurice Hamington Looks at her as "the first woman 'public philosopher' in United States history". Harvard University Library Open Collections Program. Women Working, 1870-1930. 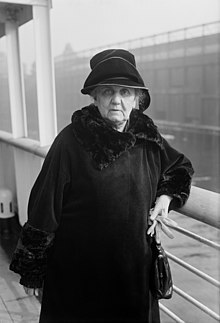 Jane Addams (1860-1935). A full-text searchable online database with complete access to publications written by Jane Addams.